SI Precast manufactures many concrete farm products and farm equipment used in the agricultural industry including cattle guards, feeding troughs, freeze proof water troughs, pasture bunks, and spring tanks. Our products are manufactured with 5,000# psi concrete. Delivery is available in most areas. Check out our locations to find a manufacturing facility near you. Visit our Resource Center for shop drawings of farm products and a downloadable Product Catalog. SI Precast Concrete cattle guards are cast in one piece with 5,000# psi concrete and are available in lengths from 4’ to 16’. 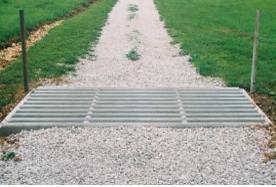 Cattle guards are reinforced with steel rebar and are designed to withstand heavy machinery and implements with load limits that meet DOT approved weights. Our concrete cattle guards are cast with rounded top and cross rails with 5” rail spacing to keep your livestock from crossing while providing gateless entry and exit. What makes our cattle guards unique? ONE PIECE CONSTRUCTION. We will deliver and set your cattle guard. Need installation instructions? Click here. Visit our Resource Center for shop drawings of cattle guards and other products, and a downloadable Product Catalog. SI Precast Concrete feed troughs are available in J-bunk and H-bunk styles. Bunks are manufactured with 5000# psi concrete and reinforced with 1/2” rebar and 10 gauge wire creating a concrete feeder that is durable and long lasting. Ends are available in both J and H styles. All feeding troughs are manufactured in one piece with attached legs. SI Precast Concrete feeding troughs are low maintenance and stronger than their steel counterparts. These may be the last feeding troughs you will ever purchase! Visit our Resource Center for shop drawings of feeding troughs and other products and a downloadable Product Catalog. SI Precast Concrete feed bunks are ideal for pasture or feedlot usage. Feed bunks are manufactured with 5000# psi concrete and reinforced with 1/2” steel rebar and 10 gauge wire creating a concrete feeder that is durable and long lasting. SI Precast Concrete feeding throughs are cast with attached legs and are equipped with drain holes ensuring a low maintenance product that is stronger and less expensive than steel. These may be the last feeding troughs you ever purchase! SI Precast Concrete spring reverb tanks are manufactured from 5,000# psi concrete with tapered sides for added strength and freeze resistance. Our concrete water troughs are low maintenance and provide fresh water for your livestock. Great for pond or spring development! Visit our Resource Center for shop drawings of water troughs and other products and a downloadable Product Catalog. SI Precast Concrete freeze proof water tanks are manufactured from 5,000# psi concrete with tapered sides for added strength. Our concrete water tanks are equipped for gravity or pressure fed systems and are available in 100 and 200 gallon capacities, and the new two-sided, 200 gallon waterer. SI Precast’s freeze proof, concrete water tanks are low maintenance, provide fresh water for your livestock in sub-zero temperatures and are ideal for pond or spring development or connected to well or rural water supply. Need installation instructions? Click here. Visit our Resource Center for shop drawings of concrete water tanks and other products and a downloadable Product Catalog.